Jakob Granat (1871-1945) was a Jewish merchant and businessman born on 18 October 1871 in Lemberg (now Lviv, Ukraine), then part of the Austrian empire. He left Europe in July 1887 to seek his fortune in the U.S., where he was known as Jacob Granat. He became a naturalized U.S. citizen in New York City on 11 July 1900, having worked as a salesman in New York, Chicago and San Antonio, Texas. Granat moved to Mexico City (where he was known as Jacobo Granat) in about 1905 and lived there, with periodic trips back to the U.S. until at least the 1920s. His brother also lived in Mexico City. Granat established various businesses in Mexico, including a leather and curios shop, a printing company and a small chain of cinemas. Granat is credited with opening the city’s first public cinema – El Salón Rojo – by elegantly remodeling the interior of the downtown eighteenth century building known as Casa de Borda. The renovations included the installation of Mexico’s first electric escalator. El Salón Rojo quickly became the most famous of Mexico City’s early movie houses and the one favored by all the high society families, including those close to President Porfirio Díaz. To help publicize the silent films being shown, which starred both Mexican and foreign actors, Granat published a series of small movie lobby cards, similar to postcards, sold in the theater lobby. These became popular collectors’ items as did the series of picture postcards he published showing people, views and scenes from all over Mexico. 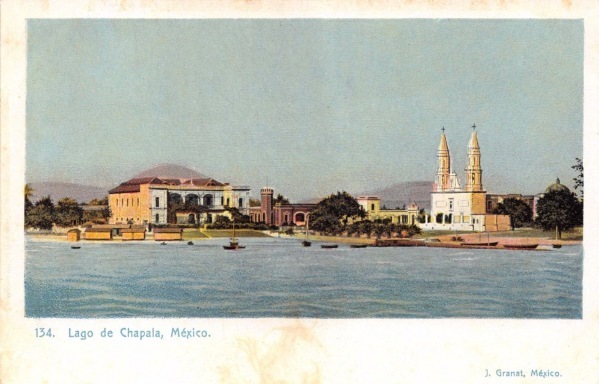 Granat is believed to have published around 300 postcards, including this one of the buildings along the waterfront in Chapala in about 1905. The most prominent buildings are the Arzapalo Hotel (opened in 1898) with its bathing huts (on the left), the turreted Villa Ana Victoria owned by the Collignon family (in the center) and the San Francisco parish church with its twin towers. Lago de Chapala, ca. 1905. Postcard published by J. Granat. During the Mexican Revolution, Jakob Granat claimed on repeated passport applications to have returned to the U.S. every year since 1905 for between two and six months, though these claims may have been made only to prevent losing his right to a U.S. passport. Later, Granat sold his cinemas to William O. Jenkins, an unscrupulous American businessman and property speculator who was living in Mexico City, and moved back to Europe. Granat continued to visit Mexico periodically, presumably to see family members (including a sister-in-law and her children) still living in Mexico City. When the second world war began, Granat (and his wife?) found themselves trapped in Europe. Despite the claim made in Mexican sources that Granat was killed in the gas chambers at Auschwitz in 1943, the Holocaust Survivors and Victims Database lists him as dying in the equally infamous Bergen-Belsen concentration camp two years later, on 27 January 1945. His wife’s name does not appear in the database, though it is possible that she did indeed die in Auschwitz in 1943, since only fragmentary records exist of the thousands who lost their lives there. Miroslava Callejas. 2016. El primer cine capitalino y el primero con escaleras elétricas, El Universal, 24 October 2016. Arturo Guevara Escobar. 2011. “Letra G. “Fotógrafos y productores de Postales.” Blog entry dated octubre 4, 2011. Gregory Leroy. 2017. “The adventurous and tragic life of Jacob Granat” Blog post on Early Latin American Photography.